The enthusiasm of the tourists who went to see the dolphins playing in their natural habitat quickly waned, as instead, they attended a real funeral procession. Some of the tourists who came to Dana point on the southern California cost were stupefied to see the funeral. This surreal event was captured on video camera, uploaded on YouTube and then diffused by HuffPost. 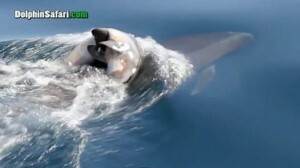 An adult dolphin was very hardly swimming with the dead body of her baby on the back. The mother and dead baby were surrounded by other dolphins, as if they were protecting them. This dolphin was again seen an hour later by another boat and the corpse of little dolphin baby was still attached to the fin of the mother. Video of the event can be seen here.